Eating a salad is healthy, unless it’s topped with high calorie, high fat salad dressings that can easily add hundreds of calories. Instead, eat “The Walden Way” and enjoy a collection of Walden Farms Calorie Free Salad Dressings. We also carry 5 popular flavors of Walden Farms Calorie Free Salad Dressing in Single Serve Packets. 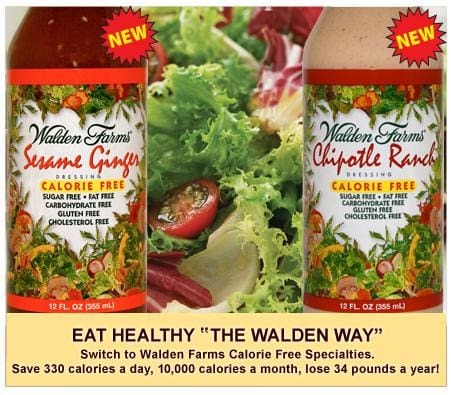 What everyone is saying about Walden Farms Calorie Free Salad Dressing - Available in 23 Flavors!